The UN Secretary General has accused all parties in Syria's civil war of "flagrant violations" of international law over the delivery of aid. Ban Ki-moon urged the Security Council to act to implement a resolution passed in February demanding greater access. In his second report to the council on the resolution, Mr Ban said almost 3.5m civilians were being denied vital aid, including medicine and medical care. 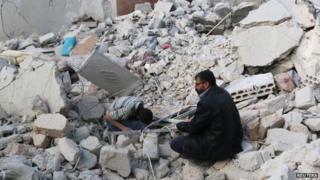 Activists say about 150,000 people have died in Syria's three-year civil war. Millions of people have fled their homes as fighting shows no sign of easing. In report described by the BBC's Nick Bryant at the UN as a strong rebuke, Mr Ban wrote: "The Security Council must take action to deal with these flagrant violations of the basic principles of international law." The report did not specify what measures the council should take. The resolution approved in February called on all parties to allow aid to cross conflict lines and borders. However Mr Ban told the council that Syria remained "an extremely challenging environment in which to work". He added that the situation was getting worse. "Thousands of people are not getting the medical care, including life-saving medicines, that they need," he said. Earlier on Wednesday, UN humanitarian chief Valerie Amos told Reuters news agency that hopes for a political deal to end Syria's war were fading and it was getting harder every day to send aid to trapped and displaced civilians. Our correspondent says Britain, America and France are considering a further resolution taking punitive measures against the government of President Bashar al-Assad, but it would almost certainly be blocked by Russia. The uprising in Syria began in March 2011 after security forces opened fire on protesters. The country has since descended into civil war as rebel brigades - including Islamists and jihadists linked to al-Qaeda - battle government forces for control of cities, towns and the countryside.